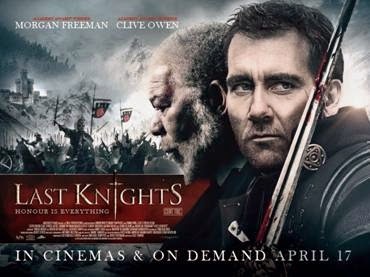 Academy Award® winner Morgan Freeman (The Shawshank Redemption, Invictus) and Academy Award® nominee Clive Owen (Closer, Children of Men) star in Last Knights, the electrifying English language debut from Japanese auteur Kazuaki Kiriya (Casshern, Goemon). In an age of honour and justice by the sword, Raiden (Owen) is a fallen warrior who must rise up against a corrupt and sadistic ruler to avenge Bartok (Freeman), his dishonoured master. This epic, sword-clashing adventure of loyalty, honour, and vengeance also features an international cast which includes Aksel Hennie (Hercules, Headhunters) Iranian actress Shohreh Aghdashloo (Percy Jackson: Sea Of Monsters), South Korea's Ahn Sung-ki (The Tower) and Italian star Giorgio Caputo (The Hideout).